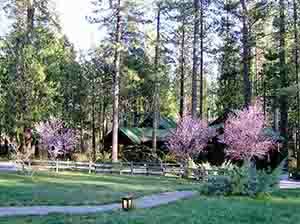 quietcreekinn.com – Secluded Quiet Creek Inn sits on seven wooded acres along Strawberry Creek in the sylvan village of Idyllwild, Southern California’s undiscovered mountain haven. Newly revitalized studio cabins and one-bedroom suite cabins offer all the modern amenities, close to all the attractions yet just off the main roads. Many species of local plant and animal life are onsite and our grounds are a Certified Wildlife Habitat & Bird Sanctuary by the National Wildlife Federation. Join us and enjoy tall majestic trees, abundant wildlife, hiking trails, a nap in a hammock, and country elegance year-round! strawberrycreekinn.com – A tranquil retreat to rejuvenate your mind and body, our historic craftsman bed & breakfast inn offers peaceful luxuries and simple pleasures. Walk along adjacent Strawberry Creek, savor a home­made breakfast of farm-fresh ingredients, read in the library, lounge in a hammock under the trees, or bask in the sun year-round in the solarium lounge. 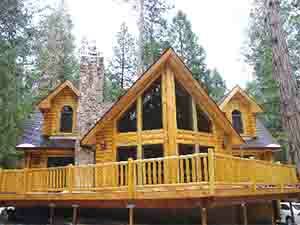 ExperienceIdyllwild.com – We are an Owner-Managed Boutique Vacation Rental Company. Staying at our properties is like staying at a friend’s cabin, only better! We maintain a 100% commitment to continually improve our vacation rentals based upon guest feedback. All properties offer: Upscale Amenities, 400tc Sheets & Fluffy Pillows, Wifi, Time Warner 200+ Channel Package, Forest Adventure Passes, Stocked Kitchens, and Pet Friendly “Spoiled-Dog” options with Fenced Yard. Plus, all of our cabins are walking distance to the Village! idyllwildvacationcabins.com – 40 Vacation Cabins sleeping 1-20 guests. 24-hr customer service! All cabins professionally cleaned. Pet friendly, walkable to town, hot tubs, secluded and most with cable and Internet. newspiritvacationhomes.com – Luxurious vacation getaways throughout Southern California, including Idyllwild, Lake Arrowhead, Palm Desert and Temecula wine country. New Spirit Vacation Homes offers a variety of rental homes, from one to five bedrooms with views from the forest to the ocean. Experience the unique features of The Dome or a log cabin. Properties offer a fully equipped kitchen, fireplace, cable TV, jacuzzi tubs, Wi-Fi and include linens. The personable staff provides 24-hour service. Pets are welcome. 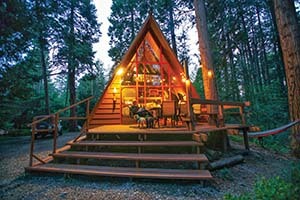 rvonthego.com – 267 RV/Tent sites, cabin rentals, lodge, pool table, video games, activities, hiking. Seasonal: activities, entertainment, horseback riding, fishing, heated pool, store and café. Annual lease sites, monthly rates and group events. CampBuckhorn.org – Committed to providing an inspirational environment for a diverse community of faiths and organizations. Open year round for groups of 35 to 350! Fantastic Views, Fabulous Fun, Fine Food. milehighcountryinn.com – Guest rooms and intimate suites with Whirlpool tubs and private decks. Air conditioning, fireplaces, king beds, Wi-Fi, cable TV, fridges, microwaves and coffee. No pets. Cash only. Low rates. Check in at 2 p.m.
idyllwildinn.com – Located in the heart of the village, walking distance to restaurants, shops and galleries, this historic inn offers cabins from studios to three bedrooms with kitchens, fireplaces, cable TV and Wi-Fi. 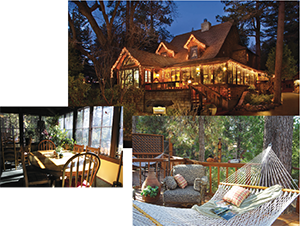 www.silverpineslodge.com – 1 block from the village of Idyllwild, 13 rooms at the Lodge overlooking Strawberry Creek & the Koi pond. 11 new rooms at the Village. 6 Private homes. www.grandidyllwildlodge.com – The Grand seamlessly combines elegant grandeur with a sense of rugged mountain adventure. Guests will enjoy an array of amenities including a full breakfast, spa services, fitness room and sauna, in a prime location near town. creekstoneinn.com – A cozy, luxurious inn, each of its nine rooms perfect for a romantic couples getaway. Most rooms have fireplaces, some have spa tubs for two. Self-serve gourmet kitchen. woodlandparkmanor.com – Exclusive selection of cottages, cabins/vacation rentals. Charming cottages nestled in the pines of Fern Valley. Wooded park & pool. 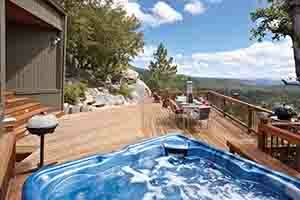 Cabin rentals in beautiful settings — some with hot tubs & most welcome pets.